Office & Research Library Hours: PLEASE NOTE NEW HOURS: Monday thru Friday from 10:30 am - 2:30 pm. The Derby Historical Society is now accepting Pay Pal for donations, membership renewals, and events. Your financial support is greatly appreciated and is very much needed to ensure that we are able to continue in our mission of preserving the Valley's history and culture. Thank you for your support of the Derby Historical Society! When making your donation please specify on the donation form, in the section marked "Optional Note" , what your donation is supporting i.e. Membership, General Donation, or Event. We are in the process of planning our year! Many new events and fundraisers are being discussed! Please be sure to check our calendar page for our 2019 Calendar of Events!!! Derby Historical Society is participating in the Big Y Community Bag Program: We have some great news! The Derby Historical Society is participating in a new donation program – the Big Y Community Bag and Giving Tag Program! The program is simple: all you have to do to support us is visit any Big Y, purchase the Community Bag and use the attached Giving Tag to direct the $1 donation to Derby Historical Society! Thank you for your support! For more information on the Community Bag and Giving Tag Program, visit, bigy.bags4mycause.com. Can you imagine if each of our supporters purchases a bag and donates to the DHS? Thank you for your support of the DHS! Annual Membership Meeting, March 24, 2019 at 2:00 pm: (Snow Date is March 31, 2019) The Derby Historical Society held our Annual Meeting on Sunday, March 24th from 2 to 4 pm at the First Congregational Church on Derby Avenue in Derby. The meeting began with a brief business meeting and an update of the Society and Restoration Project of the General David Humphreys House. Election of Officers and Board Members followed. Marian O'Keefe, Emeritus Board Member of the DHS, gave a wonderful presentation on "The Real P.T. Barnum; Businessman, Museum Owner, Politician, and The Greatest Showman in the World" Refreshments were served at the conclusion of the event. You can still renew your membership by mail, with your check made payable to Derby Historical Society, 37 Elm Street, Ansonia, CT 06401. Please e-mail us at info@derbyhistorical.org if you have any questions. Derby Historical Society is participating in the Community Awards Program at ION Bank: The 10th Annual Community Awards Program has ended. Thank you to those who voted for the DHS, your favorite non-profit, to help us earn grant money. The Community Awards Program allowed each Ion Bank customer to vote for their favorite non-profit organization to help the Ion Bank Foundation give away $60,000. We will receive a donation of $25 from the Ion Bank Foundation for every vote for our organization. It’s simple – vote for us on the Ion Bank website www.ionbank.com. Voting will took place from February 1 through March 31, 2019. You must be an Ion Bank customer to vote. One vote per customer, however, for accounts with multiple owners, each owner may vote. Customers with multiple accounts may only vote once. Each customer can vote for only one organization. Thanks again for those who voted for the Derby Historical Society! We are very excited about this giving program and hope you partnered with the Ion Bank Foundation to help the DHS! Results will be announced in May. Yesterday's Headlines (Local History Program) March 11, 2019 at 6:30 pm: Thanks to those who joined us at the co-sponsored event at the Derby Public Library on Elizabeth Street in Derby. During "Yesterday's Headlines", where local Historian Rob Novak, Jr. took participants back to 1919, 1944, and 1969 to see what what happening locally 100, 75 and 50 years ago in the Valley. Rob is past director of the Derby Historical Society and the City of Shelton's Municipal Historian. DHS AWARDED A MULTI-YEAR RESPONSIVE GRANT FROM THE VALLEY COMMUNITY FOUNDATION The Derby Historical Society has been awarded a multi-year Responsive Grant through the Valley Community Foundation's Responsive Grant making cycle, which is done with their' partner in philanthropy, The Community Foundation for Greater New Haven (TCF). Supporting donor advised funds from the Warichar Family Fund also helped make this $30,000 grant possible. The grant will be paid out over a 3 year period and will provide general operating support to the Society to preserve, maintain and celebrate the rich history of the Naugatuck River Valley. It will also allow us to present more programming and colonial demonstrations to the general public and grow our "A Day in 1762" program for Valley students and beyond!! We look forward to the opportunity for growth and doing our part to Preserve Our Place in History!! DHS RECEIVES $7,500 GRANT FROM THE PERSBACKER FAMILY FOUNDATION TOWARD FURTHER DEVELOPMENT OF OUR EDUCATIONAL PROGRAMMING Derby Historical Society has received a generous $7,500 grant from the Persbacker Family Foundation toward further development of our educational programming at the David Humphreys House and Museum. We are optimistic that we will be able to offer our A Day in 1762 program to more school students in CT and also add more programming on history of the American Revolution. We anticipate offering our expanded programming during the 2019 and 2020 school years. UPDATE ON MULTI-YEAR CAPACITY BUILDING GRANT FROM THE VALLEY COMMUNITY FOUNDATION The Derby Historical Society has recently completed a multi-year Capacity Building grant from the Valley Community Foundation which was used towards the restoration project at the General David Humphreys House & Museum. This grant was paid out over a three year period and totaled $50,000. We would like to thank the people listed below for their generous financial support towards the Restoration Project of the General David Humphreys House & Museum. Thank you to: The Persbacker Family Foundation, Brewster LaMacchia, Maurice J. Donini, Jean & Richard Widmark Foundation, Timothy P. Chaucher, Bernadette Norton, James Oram, Marian O'Keefe, John Cavallaro, Marion Aiello, Heather Barrett, Valley Community Foundation on behalf of Martha Dulla-Andrade, Elsie Valeski, Elaine Brandon, Valley Community Foundation on behalf of Beth Colette, Eugene & Addie Coppola, Judith Augusta, Renate Segrist, Marilyn Flynn, L. R & Janet Wade, Southern CT Dental Group, Lucille & Joseph Palmucci, Timothy J. Riordan, Helen Ploski, Thomas Wells, Arlene Jachyra, Virginia Costigan, Jamie Cohen, Dorothy Gleason, Georgia Morgan, Mark Anthony Izzo, John J. Walsh, John N. Wilmot, Lee Schroeter, Carolyn Balusek, Jenkins-King Funeral Home, Henry & Sandra Jemioto, Janis & Walter Yakimovich, William & Stephanie Miller, William V. McDonnell, Jr., John Coporale, Myrtle Bartolotta, Raymond Mackowski, Robert Ahearn, Tifany Gherlone, a grant from the Sophie and Robert W. Rapp Family Fund at the Valley Community Foundation by the Fund's advisor, Jo-Anna Rapp Holden. Also a grant from the Bassett Family Foundation at the Valley Community Foundation, A. John Rodriguez, Joseph Warichar, George A. Clark "In Memory of Doris & George Bush Clark", Mary Ann Micklus, Maurice Donini, James Oram, Paula & Merritt Clark, David Axelrod, Geoff & Annette Widomoski, Sally Paez, James & Patricia Oram, Kevin & Joan O'Mara, Myrtle Bartolotta, Synchrony Financial, an Anonymous Donor, and a grant from UTC. Annual 12th Night Celebration at the David Humphreys House, January 6, 2019 Thank you to all who joined us for our Annual 12th Night Celebration at the David Humphreys House on Sunday, January 6, 2019 from 12:30 pm to 4 pm. Tours of the historic house, samplings of some of the foods that were enjoyed in the 18th Century, and a wonderful Dickens Reading at 3 pm all took place during the event. Money raised will benefit our programs at the David Humphreys House. Thank you to our docents, board members, volunteers and 6th CT Regimen members for all of your hard work in making this event as great one!! Christmas Fair and Cookie Walk at the David Humphreys House, December 15: What's better than home baked cookies at the Holidays?? Many visitors came to get their delicious baked items and purchase a unique, hand-crafted special gift for the holidays! Thanks for participating in our Christmas Fair and Cookie Walk at the David Humphreys House! Proceeds from this event will be used towards replacement of our A Day in 1762 docent costumes! Thank you to our docents and board members who donated their time and baked goods to this event! Derby Historical Society's 28th Annual Appeal at La Sala Banquet Hall (Sons of Italy) in Derby on Monday, November 19th from 5:30 - 7:30 pm: Our Annual Appeal was held on Monday, November 19th at the La Sala Banquet Hall. With a donation of $45 or guests enjoyed a dinner, with stations of appetizers and chicken marsala, potatoes, salad and pasta. This year our entertainment portion of the program was An 18th Century Music Presentation by Gretchen Tucker, Soprano. For more information on Gretchen Tucker visit http://gretchentucker3.wixsite.com/soprano Our recipient of the Dr. John I. Howe Award was BHcare - Hope, Health, Recovery for their many years of service in the Valley. Thank you to the Valley Community Foundation for helping sponsor this event. Also, thank you to the David Humphreys Branch #1 of the SAR for presenting us with a Challenge Coin of David Humphreys and for the generous donation to our appeal. Thank you to all of the individuals and organizations who donated to our event. Donations can still be mailed to Derby Historical Society, 37 Elm Street, Ansonia, CT 06401. We truly appreciate your continued support in helping us keep our Society financially viable. Open Hearth Cooking at the David Humphreys House, November 17: We are so thankful to those who joined us on November 17th from 1 pm to 4 pm for our Open Hearth Cooking Demonstrations. Our guests enjoyed tours of the David Humphreys House and sampled seasonal offerings cooked over our Open Hearth. Thank you to our talented docents, volunteers and board members who helped at this event; Allegra, Alexis, Cyndi, Dawn, Elaine, Elisa, Jessica, Lorraine, Maria, Markanthony, Paula, Sandy, and Tara. Yesterday's Headlines (Local History Program) November 13th at 6:30 pm: Many thanks to those who joined us at our co-sponsored event at the Derby Public Library on Elizabeth Street in Derby. During "Yesterday's Headlines", local Historian Rob Novak, Jr. took participants back to 1918, 1943, and 1968 to see what what happening locally 100, 75 and 50 years ago in the Valley. 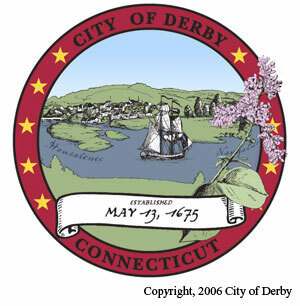 Rob is past director of the Derby Historical Society and the City of Shelton's Municipal Historian. There will be a series of talks taking place at the Library during 2019. Dates will be posted soon. Open House and Elm Street Cemetery Walk, October 21st: Thank you to those who stopped in for a guided tour of the General David Humphreys House or a walk in the *Elm Street Cemetery on Sunday, October 21st. Tours took place from 1 to 4 pm. We had some first time visitors who absolutely loved their time spent at the DHH! Thank you to Lorraine, Jody, Sandy, Allegra and Alexis for helping out!!! Derby Historical Society's Annual Silver Tea - Monday, July 9, 2018 at LaSala Banquet Hall in Derby: Our 28th Annual Silver Tea was held at the LaSala Banquet Hall in Derby from 2:00 to 4:30 pm on Monday, July 9th. Tammy D. R Williams portrayed Joan Jackson - An Unchained Love Story. This wonderful fundraising event helped the Derby Historical Society continue with our Educational Programming. To read more about Tammy visit http://hiddenwomen.org/website/ Thank you to those who supported this event! Derby Historical Society's Annual Silver Tea - Monday, July 10, 2017 at LaSala Banquet Hall in Derby: Our 27th Annual Silver Tea was held at the LaSala Banquet Hall in Derby from 2:00 to 4:30 pm on Monday, July 10th. Sheryl Faye portrayed Eleanor Roosevelt "The First Lady of the World" at this wonderful fundraising event. You can read more about Sheryl Faye by visiting her website http://www.sherylfaye.com/ The event was very well attended - thank you to all of our supporters! Thank you to our sponsors for your support of this event -- we couldn't do it without your help! The Great Give 2017: Thank you to all who donated during the Great Give on May 2nd & 3rd. This 36 hour, online giving event helped the Derby Historical Society secure over $2,150.00 in donations! Thank you to the Frey Hershey Foundation, Richard Armstrong, Mary Mycek, Marian O'Keefe, Cynthia Poppa, Patricia Ellis, Elaine Brandon, Barbara Jean Garofalo, Elisa Uhrynowski, Elise Valeski, Albert Misiewicz, Jr., Paul Simpson, Randal Ritter, Dorothy Gleason, Judith Augusta and John Poole for donating! Also, thanks to the CFGNH & VCF for their donations! We couldn't do it without your support! Celebrate CT Libations - Round 2, Monday, April 24: Thank you to all who attended and supported our fundraiser for the Restoration Project at the General David Humphreys House & Museum on Monday, April 24th from 6 pm to 9 pm. The event was held at THC The Hops Company in Derby. Samples and tasting of beers/cider from several CT Breweries and great music from "Dead Fish For Christmas" were enjoyed by all. Thanks to Two Roads Brewing Company, Thimble Island Brewing Company, Stony Creek Beer, No Worries Brewing Co, Shebeen Brewing Company & New England Cider Company for supporting us and pouring for our guests, and supplying some wonderful door prizes. Thank you to Umberto at THC for donating the facility for the evening and to Nina for all of her help with the event. Thank you to the Valley Community Foundation for sponsoring us again this year. Thanks to Zuppardi's Apizza for the delicious food and gift certificate for our door prize drawing. Thank you to Paul Flynn for providing wine for door prizes. Thank you to Gouveia Vineyards and Jones Family Winery for the prizes also! Last but certainly not least, thank you to the Persbacker Family Foundation for matching the funds, over $4,000, that were raised during this event. Derby Historical Society Annual Meeting, Sunday, March 26: The Derby Historical Society held our Annual Meeting on Sunday, March 26th from 2 to 4 pm at the Ansonia Fire Museum on Howard Avenue in Ansonia. The meeting began with a brief business meeting and an update of the Society and Restoration Project of the General David Humphreys House. Election of Officers and Board Members followed. Guests enjoyed a tour of the Fire Museum by volunteers from the organization. Refreshments were served at the conclusion of the event. Thank you to those who made this meeting happen and extra thanks to the Ansonia Fire Museum! New memberships and renewals can be mailed to with your check made payable to Derby Historical Society, 37 Elm Street, Ansonia, CT 06401. Please e-mail us at info@derbyhistorical.org if you need a form. Christmas Fair and Cookie Walk at the David Humphreys House, December 17 Due to the weather this event was postponed until December 18th! Thank you to those who joined us for our Christmas Fair and Cookie Walk at the David Humphreys House from 10 am - 1:30 pm. Many trays of home-made cookies at a great price of $5 for 18 cookies (1.5 dozen), were purchased at this event. Unique, hand-made gifts were purchased from our talented docents as well as books, toys, and other items from our Gift Shop. This event will benefited our Education Programs. Open Hearth Cooking at the David Humphreys House, November 19: Thanks to those who joined us for on November 19th from 1 pm to 4 pm for our Open Hearth Cooking Demonstrations. Tours of the David Humphreys House were conducted. Guests enjoyed some fine samplings of Apple Charlotte, Peas Porridge, Carrot Pudding, Cranberry Relish, Apples and Onions, Butternut Squash Bisque, and Cornbread, along with refreshing Apple Cider. This event benefited our Restoration Project and A Day in 1762 Program. Thank you for bringing your family and friends to enjoy "A Taste of the Past". Derby Historical Society's 26th Annual Appeal is being held at La Sala Banquet Hall (Sons of Italy) in Derby on Monday, November 14th from 5:00 - 7:30 pm: Thank you to those who attended our Annual Appeal Event. Our speaker was Dr. Brian Jones, State Archaeologist who discussed his preliminary findings at the dig at the DHH in June. Roy W. Tidmarsh was our Dr. John I. Howe Award recipient, posthumously. Roy's brother, Fred and some family members were there to receive the award. You can still make a donation to our Annual Appeal which helps the Derby Historical Society to meet our expenses and provide the services that are so important to our community. Donations can be mailed to Derby Historical Society, 37 Elm Street, Ansonia, CT 06401 Thank you for your continued support!! Tours of the David Humphreys House & Elm Street Graveyard Walks, October 23rd: Thanks to those who made this a very well attended event on October 23rd from 2 pm to 5 pm for tours of the David Humphreys House and Elm Street Graveyard Walks. We raised $100 towards our Restoration Project of the David Humphreys House & Museum, which will be 100 % matched by the Persbacker Foundation. Additionally, we also raised $85 dollars in donations and $60 in our gift shop to benefit future programming at the DHH. Derby Historical Society's Annual Silver Tea - Monday, July 11, 2016 at Molto Bene Restaurant, 557 Wakelee Avenue, Ansonia: Our 26th Annual Silver Tea was held on July 11th at Molto Bene Restaurant in Ansonia from 2:00-4:30 pm. Stephen Collins portraying Walt Whitman, "Unlaunch'd Voices - An Afternoon with Walt Whitman", was our speaker. You can read more about the program at http://www.unlaunchedvoices.com/ Refreshments of tea sandwiches, baked goods, punch, coffee and tea were served. Our raffle was very successful and many wonderful prizes were won. Thank you for your support of this wonderful event!! CT OPEN HOUSE DAY - Saturday, June 11th from 10 am to 3 pm at the General David Humphreys House: Thank you to all who participated in and visited us at Connecticut Open House Day celebration held at the General David Humphreys House on Saturday, June 11th from 10 am to 3 pm. Visitors joined in the offerings of tours of the museum and outside historic district. There were demonstrations of colonial crafts and skills, musket firing and drills by the 6th CT Regiment, and much more. Our on-site building that houses "Derby Junction", which is a layout depicting the cities of Ansonia, Derby, and Shelton circa @1918, was open for viewing. This wonderful layout was donated to us by Mr. Benjamin Bacon in 2001. Our colonial plant sale was a hit with the visitors. Thank you for your donations to the Historical Society. The Derby Historical Society participated in the Great Give 2016 - a 36 hour online giving event! Thank you for your support of the Derby Historical Society & The General David Humphreys House & Museum! We are happy to report that we raised over $2,125.00. We couldn't have done it without you! Your dollars will help us with our operating costs, programming and keeping the rich history of the Valley alive! Thank you to: Ginny Ellis, James Norton, James Cohen, Charles Seccombe, Mary Mycek, Markanthony Izzo, Elaine Brandon, Elsie Valeski, Cynthia Poppa, Barbara Jean Garofalo, Judith Augusta, Edward McCreery, Donald Woodworth, Jr., Albert Misiewicz, Dorothy Gleason, Randal Ritter, Beth Collette, Marian O'Keefe, Michael Hokanson, the Frey Hershey Foundation & an anonymous donor! CELEBRATE CT LIBATIONS - MONDAY, APRIL 25, 2016 FROM 6 TO 9 PM AT THC THE HOPS COMPANY, DERBY, CT Thank you to all who attended our fundraising event at THC The Hops Company, 77 Sodom Lane in Derby. It was a night of CT Libations, delicious food, great music & fun all to benefit the Restoration Project at the David Humphreys House & Museum. We raised $4,440 during this event. We are thrilled to report that the total will be matched dollar for dollar thanks to a generous grant from the Persbacker Family Foundation! Awesome news for our restoration! A great big thank you goes out to Umberto Morale, owner of THC The Hops Company for donating his venue for our event!!! Guests sampled craft beer from Two Roads Brewing Company, Black Hog Brewing & Stony Creek Brewing Company - all poured by representatives of the breweries. There were also samples of wine from Jones Family Farms and Winery and Sunset Meadow Vineyards. Ricky D's Rib Shack and Zuppardi's Apizza provided food for our patrons. Much fun was had listening and dancing to great music from “Dead Fish for Christmas” and a book talk by CT’s Beer Snob, Will Siss, rounded out the night! Door prizes were provided by THC The Hops Company, Gouveia Vineyards, Jones Family Farms, Two Roads & Stony Creek Brewing Companies, and Will Siss for the drawings throughout the event. As the cornerstone of the Derby Historical Society, the David Humphreys House serves as both a museum and as a hands-on classroom for our “Day in 1762” program; introducing school children to Derby’s Revolutionary War Hero, David Humphreys and the region’s colorful colonial past. As you can imagine, a 300-year-old house requires quite a bit of upkeep. We are currently in the process of raising $200,000 for a major restoration of the exterior of the building. Did you know that back in 1657, Derby’s first permanent settler, Edward Wooster, was drawn to the Lower Naugatuck Valley on the quest of raising hops? Cheers to a great time for a great cause!! Your continued support of the DHS helps us "Preserve Our Place in History"! Visit the Humphreys House Gift Shop! This website began in 1998 as part of the Electronic Valley Project, linking the towns of the Lower Naugatuck Valley to the World. Initial funding was provided by the SNET Museums for the Millennium Project. The Naugatuck River Valley (comprised of Ansonia, Beacon Falls, Derby, Naugatuck, Oxford, Seymour and Shelton) was chosen as an All-American City in 2000. Copyright &COPY; 2001-2019 by Derby Historical Society.